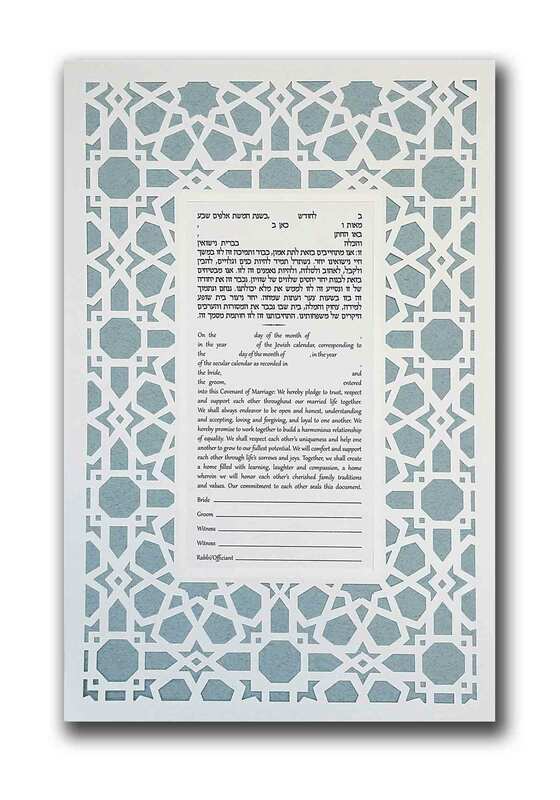 I am happy to present this papercut ketubah template that you can print at home and cut out. 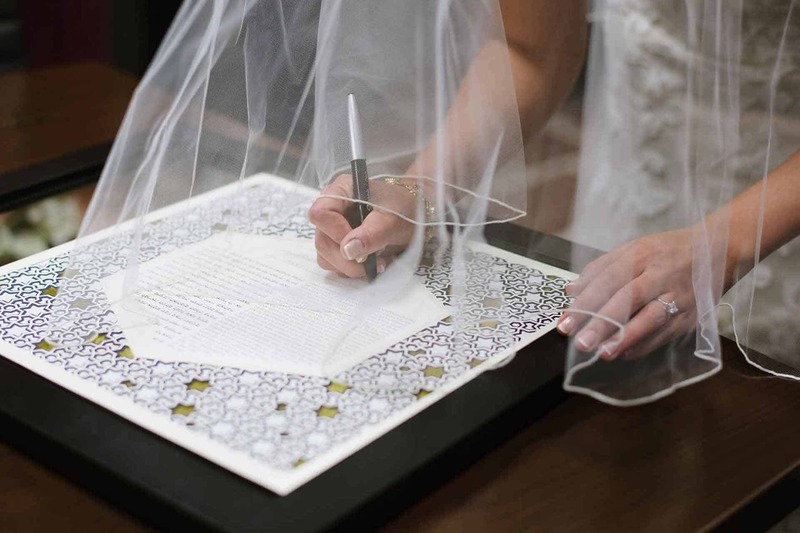 There are many reasons you might want to make your own ketubah. 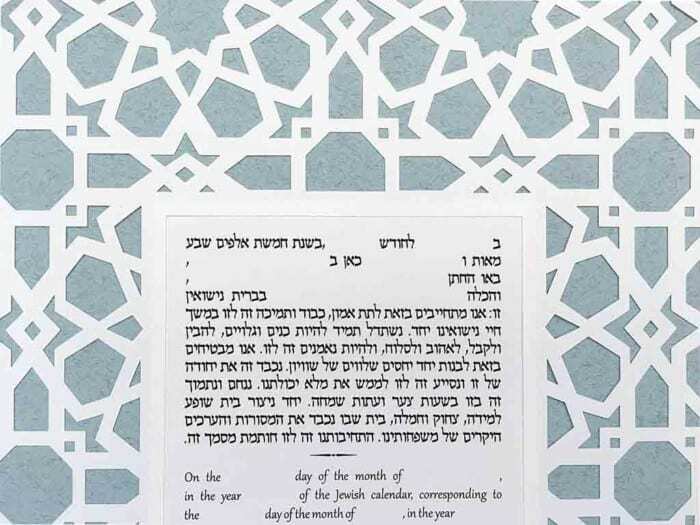 Whether a papercut ketubah doesn’t fit your budget, or you really like the idea of making your own because of the extra meaning it will hold — I understand you completely. The ketubah is and always was an integral part of the Jewish lifecycle. There is a concept of Hiddur Mitzvah, by which a beautiful ritual object makes the mitzvah itself more beautiful. By engaging not just the spirit, but also the senses, the mitzvah is appreciated more fully. Art is time-consuming in many ways: it takes skill and care to create a beautiful object and on top of that it takes a lifetime of training to gain the skills necessary to even start creating artwork. It is because of this that artwork can sometimes feel unaffordable. 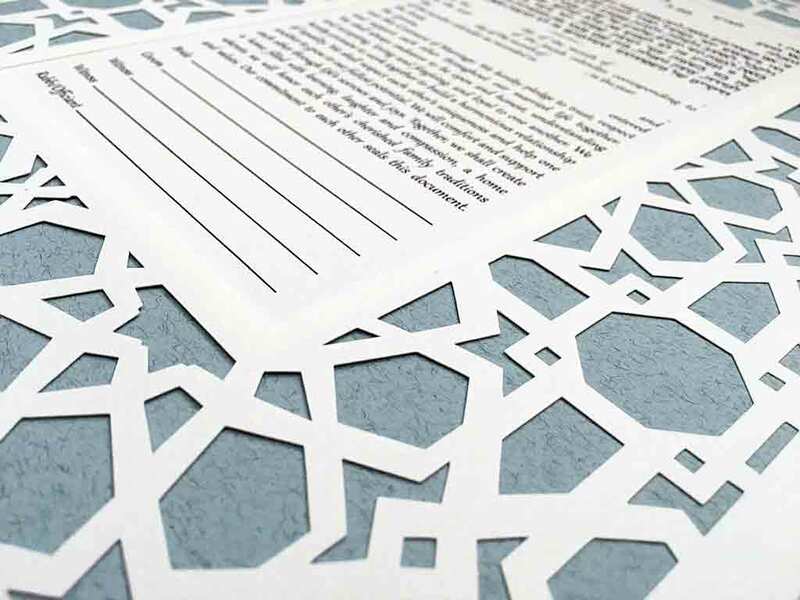 I hope that by offering this free papercut ketubah template I can allow couples who wouldn’t otherwise be able to afford a beautiful ketubah to also have a chance to honor their marriage with a ketubah they’re proud to display in their home. And how much more wonderful, when they can tell their friends they made it themselves! I only ask one thing: please respect the work that went into designing this papercut ketubah template. It is copyrighted work, and as such, it is for your personal use only. 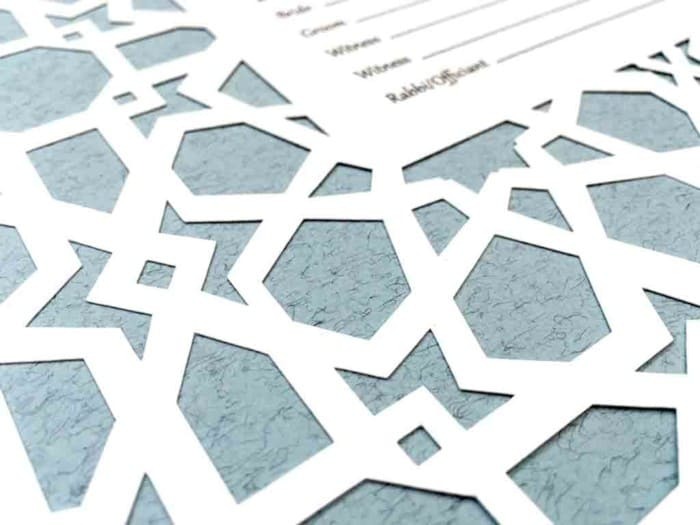 This means you are welcome to download it and make your papercut ketubah using the template however you see fit. But you are not permitted to make more than one copy; sell the papercut; sell the template, or distribute either in any sort of way. You are welcome to post photos of your papercut ketubah on social media, though! You can tag me on Instagram (@papercutsbyoren) and add the hashtag (#papercutsbyoren) so that others can see what you came up with. You are welcome to change the colors of the paper as you see fit — it’s completely up to your tastes. You can put anything you want as a background. I personally recommend either a mirror; a watercolor painting you create to go underneath it; or a suede mat — the possibilities are endless and you should let your imagination guide you. Also, please send photos of your ketubah signing! I would love to feature you on the blog! A lot of hard work goes into creating these designs, and a ketubah is an item that will hold immense value for the rest of your life together. I hope you enjoy hand-crafting your own ketubah and that it brings you much joy! This template is designed to be easy to cut. Simply print it out on any printer that can handle 11×17 paper — any copy shop will charge only a small fee to print out the document. I suggest using 100 lbs cardstock so that the ketubah will remain sturdy once it’s cut. The design’s shapes are generously thick to allow a wide margin of error while working on it. This doesn’t mean you will find it easy, though. Allow two to three sessions to complete the papercut. When you feel your hand, wrist, or eyes getting tired, take a break! This is the moment where it’s most likely you will make a catastrophic mistake. In papercutting mistakes cannot be fixed and you will have to start over. Always cut AWAY from your fingers so that you don’t accidentally slice yourself. Make sure to use proper tools: at the very least a cutting mat, and sharp craft blades. Expect to go through at least three blades while cutting this design. DO NOT work with dull blades. A dull blade will catch and can cause a slip, resulting in injury. By downloading this file you agree to respect the copyright. You further agree that you will be using the template at your own risk. I will not be responsible for any harm that might come to you while attempting to cut the design template. Papercutting involves dangerous tools and you must have a full understanding of how to handle a blade before you commence work on the design. 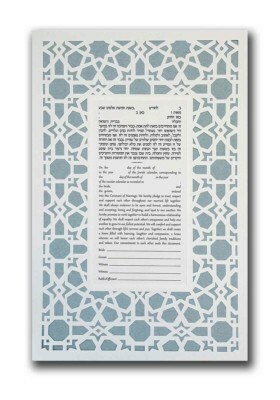 This ketubah template is offered as-is without warranties implied or otherwise. This template is available in two version. The first is the RCA (Rabbinical Council of America) Nusach. It is appropriate for any Orthodox wedding in North America. The second is the standard Humanist 1 text, which is appropriate for any couple who is either Reform or secular. I offer this ketubah exactly as it is in the corresponding document. The personal details are left blank, to be written in by your officiant. I and am regretfully unable to change the text to other versions. So if you need a text other the ones available, you can change the text by cutting away the text area, making a window and placing your preferred text in the resulting empty space. WANT ME TO MAKE THIS KETUBAH FOR YOU? You also can order the completed ketubah direct from me using the link below. I will make it for you according to the same care and high standards of any of my other designs. I can make this ketubah with any text you need to match your rabbi’s specifications.